ABOVE: Tourists and local teenagers hang out on the steps below the Basilica of Sacré-Coeur in Montmartre. INSET BELOW: A side view of the Basilica and its Campanile, or bell tower, which was added in 1904. 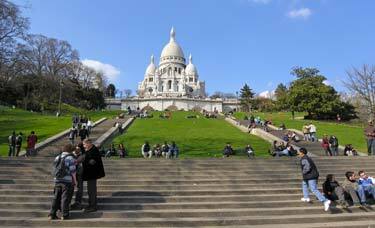 The Basilica of Sacré-Coeur is probably the second most popular tourist church of Paris after Nôtre-Dame Cathedral. It's far less important historically (or in terms of architecture) than either the cathedral or the former royal chapel of Sainte-Chapelle, but if you're visiting Montmartre--as you should do--it would be a mistake not to wander through the basilica and enjoy the views from its steps. If you're devoted to the cult of the Sacred Heart, a visit to Sacré-Coeur will be a moving experience; if you don't, you may feel that the church is a monument to your great-grandmother's brand of Catholicism and an over-the-top expression of religious theme-park architecture. Still, it's too big and visible to ignore, and the views from the platform in front of Sacré-Coeur and the base of its dome are hard to beat.